— Love is patient and Love is Kind. But if we are too busy to make a space for kindness and patience, we cannot love others as God wishes us to do! This is the second sermon for Rick Warren’s 40 Days of Love Campaign. As you may know, for the 40 days until Easter Sunday, we are studying Love. We are following Rick Warren’s 40 Days of Love program. We have small groups that are meeting each week on Monday evening at 7 pm and on Wednesday morning at 10:00 am to learn what God says about love. Come join us! I promise it will change your life for the better, because God has a lot to say about Love. Last week Pastor Jay kicked off our 40 days of Love campaign by preaching about how “God wants us to love others with the exact same kind of love that God has for us!” That is a pretty tall order, because God is the best person in the universe at loving. But we can equip ourselves to be better lovers by learning what God teaches us about love in the Bible. And there is no better way to learn about love than by studying how Jesus loved. But… no matter how much we learn about love, if we don’t put into practice, our knowledge is useless. If we are too busy to love God and love others with intentionality and effort, then busyness has blocked us from achieving God’s highest goal for our lives! God wants us to love first and foremost above all other things. Anything that keeps us from loving God and loving others as our highest priority is not from God at all. It is from Satan. There is nothing that the accuser wants more than to keep people from giving and receiving God’s love. A life robbed of love is the saddest thing I have ever heard of. That song “Cats in the cradle” is listed as watchmojo.com’s 10 songs most likely to make you cry. It is sad how we sinful humans mess up loving relationships by spending our time, energy, and money on lesser things. For those who joined us for the small group session this past week, Rick Warren reminds us that Nothing is more important than relationships. Jesus summed up all of God’s commandments and laws in Mark 12:29-31, “The most important one,” answered Jesus, “is this: ‘Hear, O Israel: The Lord our God, the Lord is one. Love the Lord your God with all your heart and with all your soul and with all your mind and with all your strength.’ The second is this: ‘Love your neighbor as yourself.’ There is no commandment greater than these.” We were created by God for relationships. Relationship with God, and with other people. These relationships are the only things we will take with us into eternity. And these relationships will only be good to the extent that they are loving relationships. And I mean loving in the selfless and intentional way that God loves us. None of us can build loving relationships if we are too busy to make time to love God and others with selflessness and intentionality. This task of loving is a hard one because it requires our time and attention. In this day and age time and attention are in short supply. Our world is a world of busyness and distraction. Screens constantly spew content at us. Our phones ding and chirp for our attention. There are planes to catch, bills to pay, houses to maintain, groceries to buy. You get the idea. If that wasn’t enough, there is always some disaster or crisis somewhere that can create anxiety in us. God’s own presence is the antidote for the business we feel we must have in our life. So if you want to fight back against the business that keeps you from loving God and others, the first step is to make time and space in your life to be still and be with God. It is impossible to love God without making dedicated time to meet with God. Now, Meeting with God requires calm and focus. Multi-tasking is not really an option here. Some people like to schedule time to be alone outside in nature, so they can speak with God. Some people like to quietly read the scriptures and pray. Some people even like to calm their minds with yoga, or exercise, so they might speak to God and listen for God’s voice with a clear mind. The key is focus and intention. You probably know this, but you don’t need to pray out loud in order to speak with God. Our God is a mind reader. However you choose to intentionally meet with God, you must schedule a time in your day to do it. That is the sacrificial love part. Busyness will tell you that you don’t have time. This just isn’t true. Write a time that works for you on your daily planner, or in your online calendar. Even if you have never done this before, and it feels weird to sit, alone, in a room with a Bible for 15 minutes or so. Do it. As we intentionally spend time with God, God will give us more and more power through the Holy Spirit to combat the busyness in our life. And then we will meet with God even more. The more we meet with God, the stronger we can receive God’s love in our life. The Psalmist knew this well. Making a time to meet with God in an intentional, focused way is how we can obey the first part of what we call Jesus’s greatest commandment. The second part of the greatest commandment is to love others as ourselves. Busyness is the enemy of love in our relationships with others, the same as it is the enemy of love in our relationship with God. The second part of the greatest commandment requires a second defense against business. The First defense against busyness is to schedule some quiet time with God regularly, every day if you can. The second defense is to love others intentionally in your life. I mean to intentionally love others with the same kind of selfless love that God has for you. This lesson has not changed since the earliest days after Jesus gave us the greatest commandment. Scripture tells us that Early Christians took Jesus’s command to love very seriously. Paul even tells people to sacrifice getting married and possibly having children, so that they might intentionally live their whole lives for others. That is a pretty big sacrifice to make! Paul makes it clear. In scripture passage from his first letter to the Corinthian church, Paul tells people who are unmarried to stay unmarried if they can. Paul says, “I am saying this for your own good, not to restrict you, but that you may live in a right way in undivided devotion to the Lord.” Don’t misunderstand this passage and think that somehow it is wrong or less great to have a family. The main point is to be extremely intentional in your life about loving God and Loving others. One way we can do this is by building space into our daily schedules to love people as opportunities arise. Often God gives us opportunities to love that are distractions from our plans. If we are so rigid in our planning that we have every minute of our day scheduled and tasked, we may not have flexibility to put the needs of others above our own plans. I am not suggesting that we drop everything for anyone who crosses our path with a need. There are over seven billion people on planet earth right now. That’s a lot of people. We simply cannot take time to love everyone who crosses our path. But there is a technique we can use to be more available to intentionally to love others. It is called building “margins” into our time. A doctor named Richard Swenson wrote a book called “Margin” that explains the benefits of planning unstructured time into our day as a sort of cushion. It is like planning for little interruptions that God may use to allow us to love others. How many times have you wanted to reach out to someone with a phone call, or send someone a card, or go visit someone, or lend a helping hand, but you just couldn’t find time? Busyness and schedules can keep us from loving others in practical ways. But creating a margin of time in our schedule to be left open, can keep busyness from blocking our desire to love others as we love ourselves. For example, we might end our day with an hour of margin time. Not recreation time to watch TV and hang out. That has to be scheduled in before the margin time. Margin time gives us up to one hour of unexpected loving other people in our day, and we can still get to bed on time. Maybe we decide to call or facetime a friend that we know is hurting. Maybe we are interrupted by a neighbor who needs help getting her snow blower running. Another example is that we might build in a margin of 30 minutes extra in our travel time. Let’s say you need to be at work by 8 am, and it takes at maximum of 30 minutes on a slow day to get to work. Building in a Margin for loving others might mean you leave home every day at 7 am. Then, if you see someone on the way that needs help changing a flat you have time to stop and help. In fact, you have an extra 30 minutes to handle any opportunity God might give you to love others. Imagine if the father in the song “Cats in the Cradle” had scheduled an extra 30 minutes into each day to meet with God? Perhaps he would have been more intentional about spending time loving his son. Imagine if the father in that same song had scheduled a margin time of 30 minutes to love others each day, perhaps his son would have done the same and made time to come see his old dad. 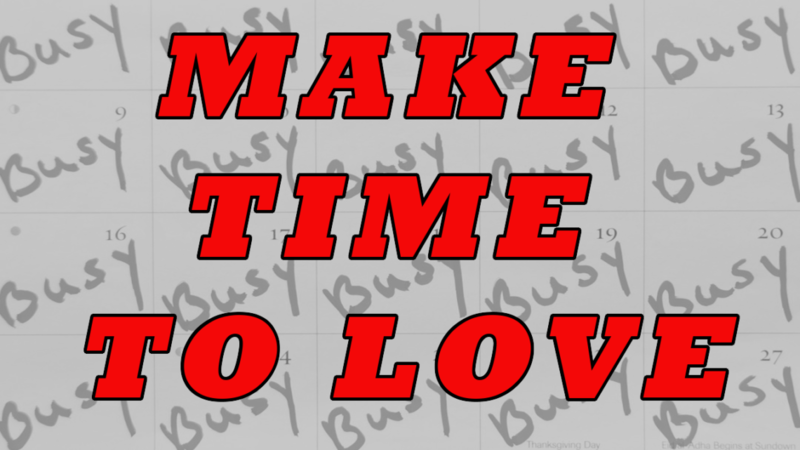 Busyness is a tool that the enemy uses to keep us from loving God and loving others. That is because God wants us to love and be loved as our highest goal. But we have two important defenses against busyness that help us to intentionally love God and others. First, we can schedule time into each day to have some Quiet time with God. Second, we can free up some time to love others by actually scheduling a margin of unstructured time into our day. Our time with God will provide the refuge we need to give and receive love with God. Our willingness to build margin time into our day will make us more available to intentionally love others in practical ways. As we keep going through lent, we are going to learn a lot more about Love, and it is going to change our lives for the better. And if we can work toward defeating busyness in our lives, we will have plenty of time to practice what we learn about love. So as we keep journeying together, I pray that we will become better lovers in general, and our lives will be enriched and please God.